Tottenham are reportedly set to offer £30m in an attempt to prise Andre Gomes away from Barcelona and beat Everton to his signing this summer. The 25-year-old struggled to establish himself in the Barcelona starting line-up after his move from Valencia in 2016, and he eventually exited on loan to join Everton last summer. The move has been good for him as he’s made 27 appearances so far this season, and it appears as though his good form at Goodison Park has led to interest from Tottenham. According to The Daily Star, Spurs will launch a £30m bid for Gomes this summer, and they’ve been handed a major boost as it’s also suggested that Everton may not be in a position financially to compete with them. With his technical quality and creative ability in midfield, Gomes would arguably be a good fit for Tottenham and boss Mauricio Pochettino, as they look to potentially strengthen the squad this summer to kick on and compete for major honours. However, the more immediate concern will be how they cope with injury blows sustained by talisman Harry Kane and Dele Alli, with both men picking up knocks in the win over Manchester City in the Champions League in midweek. With the second leg to come next week coupled with the ongoing scrap for a top-four finish in the Premier League, it will certainly be an anxious time for Pochettino and the squad, as securing a place at Europe’s top table for next season will surely be huge not only financially, but also for their ability to attract the top names this summer. 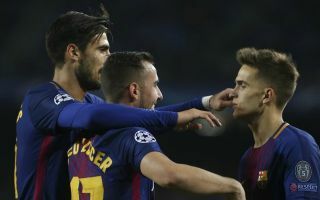 Gomes may well be one of them, and with Barcelona set to sign Frenkie de Jong this summer, as per BBC Sport, he surely doesn’t have a future at the Nou Camp with the likes of Sergio Busquets, Ivan Rakitic and Arthur also ahead of him in the pecking order.